Did you know you can substitute applesauce for the oil in a cake mix recipe and end up with cupcakes that are lower in fat as well as especially moist? 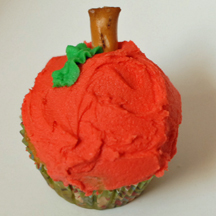 Complete the experience (or take a tongue-in-cheek jab at guests who don’t believe in crazy applesauce substitutions) by decorating your cupcakes like apples. What You Need: 1 cupcake (baked and cooled); icing tinted red; thick pretzel sticks; green icing and pastry bag with leaf tip (or just buy some of those sugared gel candy leaves). How to Make It: It’s notoriously hard to get a good, deep red when tinting icing. It’s a good idea to use concentrated gel icing (as opposed to liquid drops), and spring for the No-Taste Red in the cake aisle, because red icing can taste funky when you’re using a lot of it. (You could also just go with green apples, or pink “Pink Lady” apples.) Frost cupcake. Break off end of pretzel and stick in cupcake for stem. Pipe green leaf using pastry bag and leaf tip, or simply add candy leaf. This entry was posted on Saturday, December 29th, 2007 at 4:00 am	and is filed under food cupcakes. You can follow any responses to this entry through the RSS 2.0 feed. Responses are currently closed, but you can trackback from your own site.